I feel like it's been forever since my last post. In the past week, we took a mini road trip to St. Louis to take my sister-in-law, niece and nephew to St. Louis to leave for Germany for the next few years. They were so excited to be reunited with my brother who is in the Army. The day after we got back, my dad was admitted into the hospital with a blood clot in his arm and chest pains. The following day, my mom went home for the evening and ended up having to take my grandma to the hospital. She tested positive for the flu and pneumonia. She and my dad were at separate hospitals. Last night, a group of teachers and I volunteered after school at Convoy of Hope. Needless to say, I haven't been home much at all lately, so my blogging time has been limited. Tonight, I finally had a chance to sit down and work on my mini unit for There Was an Old Lady Who Swallowed a Cover. I discounted the price to $2 since I'm so late in posting it. Feel free to check it out on TpT if you like. 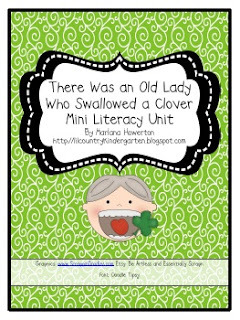 If you haven't already, be sure to head over to Can Do Kinders and print Pam's fabulous emergent reader to go with There Was an Old Lady Who Swallowed a Clover. I just purchased some more adorable graphics from Scrappin' Doodles, so look for some Easter freebies soon! I love that story, what a great idea to make a unit out of it!